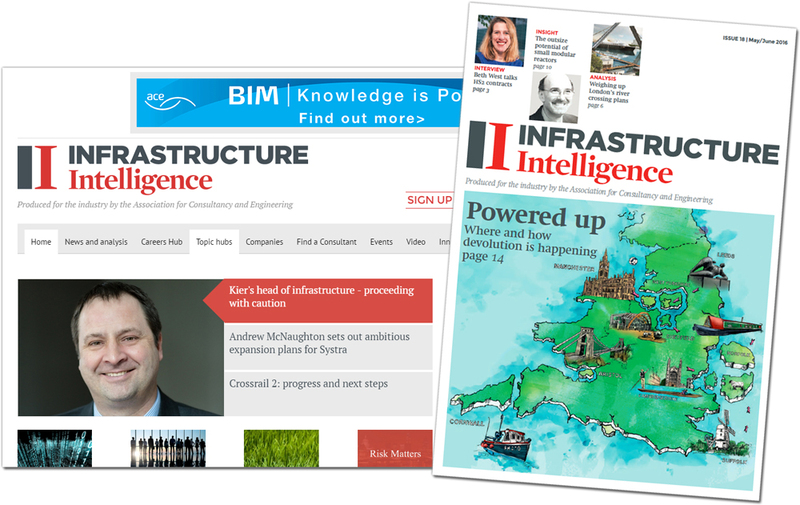 Infrastructure Intelligence is an independent information source written by the industry for the industry and is one of the few UK magazine brands dedicated to infrastructure. It thus offers an unparalleled opportunity to communicate with and ultimately influence the professionals your business relies on. As a communication and knowledge transfer tool that unites the multiple and often diverse professions involved in the infrastructure supply chain, it provides an unique and powerful link between your business and your target market, allowing you to take advantage of the growing business opportunities in the sector. Our digital and print media offer in-depth news analysis, breaking news and exclusive interviews with key infrastructure industry leaders and opinion formers. Stay ahead of the competition and gain access to the industry’s most influential decision makers through our portfolio of communication channels. We serve an unique audience in the infrastructure supply chain - manufacturers, suppliers, specialist and sub-contractors, consultants and clients, as well as government bodies, local authorities and investors. Our readers and event participants are predominantly CEOs; Senior Partners; Managing Directors; Project Directors/Managers; Senior Engineers; Contract Managers; Business Development Directors; Marketing Directors; Principal Engineers. II magazine offers a wide range of editorial opportunities which can promote and highlight your company’s project or profile. These include: Case studies, Thought Leadership articles, Company profiles, Career profiles, Recruitment advertising and Event listings/profile. If you’ve got an interesting story to tell, a case study can be the perfect platform to tell everyone about it. It could concern anything from an ingenious product or unusual product application, to a ground breaking process or revolutionary practice. All case studies will also be uploaded to the Case Study section of www.infrastructure-intelligence.com. Raise your company profile and brand awareness with a feature written by one of our journalists. Content is subject to agreement but could, for instance, cover key personnel, forward strategy, innovation or involvement in specific projects. Published profiles will also be uploaded to www.infrastructure-intelligence.com. Book a Profile or Case Study and you will benefit from coverage in both the printed and digital ver-sions of Infrastructure Intelligence magazine. Rates will vary, depending on level of editorial input. You can also of course, book display advertisements. With a plethora of unique opportunities at your disposal, we can help you select those activities that will directly impact your business and meet your specific marketing objectives.